Thanks to the diversity of New York City&apos;s population—which numbers 8.5 million—the five boroughs offer an impressive range of cuisines. 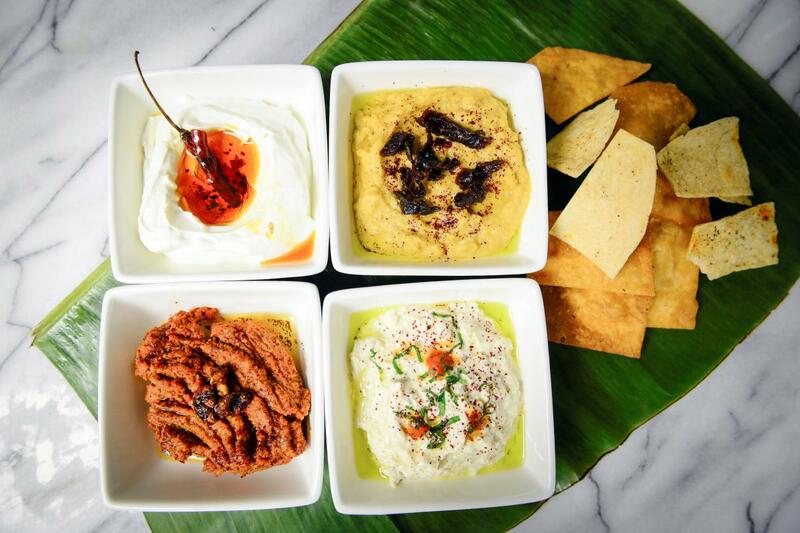 You can taste flavors from around the world without leaving the City, including delights like the delectable French-Vietnamese fusion at Noho&apos;s scene-y Indochine, as well as modern Greek favorites at the Astoria hot spot Ovelia. These are only a couple of the enticing options for your clients to try during their next visit to the City. For more of our picks, read on. The Bronx Beer Hall. Photo by Molly Flores. 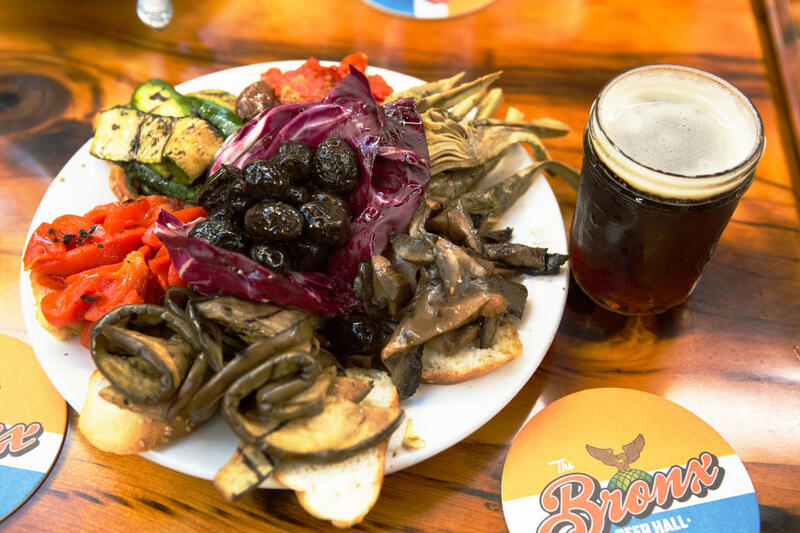 The cheerful Bronx Beer Hall is located in the historic Arthur Avenue Retail Market, where visitors can buy fine Italian-American foods as well as housewares and other goods—many imported from Italy. The beer hall serves a variety of rotating brews, including New York State craft beers, alongside dishes sourced from market favorites like Mike’s Deli and Café al Mercato. Visitors can sit at the bar to catch up on sports or at one of the tables that overlook the market’s colorful stalls. French Louie. Photo by Tagger Yancey IV. Charming French Louie, which is located a short walk from the Brooklyn Academy of Music and Barclays Center, the borough’s massive arena, specializes in French-American bistro fare. The small restaurant has picture windows that overlook bustling Atlantic Avenue and the restaurant’s seasonally open garden. Diners can opt for traditional French dishes like chicken liver pâté with grilled bread or snails in wine sauce or modern ones like cast iron–roasted chicken or oxtail pappardelle, as well as fresh oysters and mussels or steak frites prepared three different ways. Harlem Shake. Photo by Kenji Lopez. 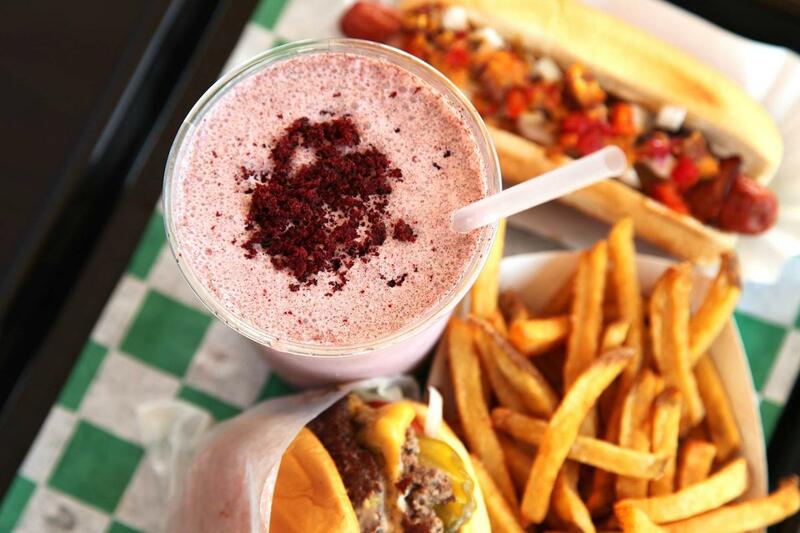 This fast-casual restaurant serves up sandwiches, hot dogs and burgers cooked on a griddle, as well as organic milkshakes. The original Harlem Shake opened in 2013 on 124th Street. The restaurant’s “wall of fame” is decorated with more than 200 signed photographs of stars like P. Diddy and Janelle Monáe. Harlem Shake’s second location in East Harlem features Latin-inspired dishes like tostones and a pulled pernil sandwich in addition to the regular menu. This slick French-Vietnamese eatery opened in a Greek Revival building in Manhattan’s hip Noho neighborhood more than 30 years ago. The retro-chic design of the restaurant—the walls have been painted with outsized palm leaves, and the spacious dining room features black leather banquettes and Japanese box lights—has made it a hot spot for New York fashion scenesters since the 1980s. Some of Indochine’s signature dishes include filet of sole steamed in a banana leaf and plum-marinated grilled salmon in lemongrass broth. The restaurant also offers a pre-theater menu, good for clients who may be attending shows at the Public Theater or seeing the Blue Man Group, located nearby. Junoon. Photo by Jay Shetty. 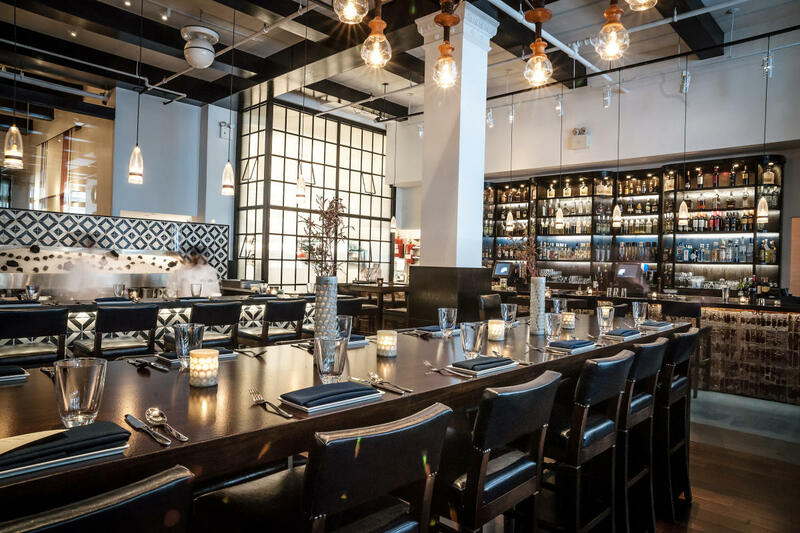 Michelin-starred Junoon is located just a few blocks from the Flatiron Building. The chic, low-lit main dining room features wooden and limestone carvings and sandstone statues that reflect India’s rich cultural history, and two semi-private rooms are available for groups. The restaurant highlights several regional cuisines from the Indian subcontinent, with exotic dishes like lobster tandoori and lamb shoulder with papaya juice and garam masala complementing familiar imports like chicken biryani. Adventurous diners can order the beyond-spicy ghost chili murgh tikka. 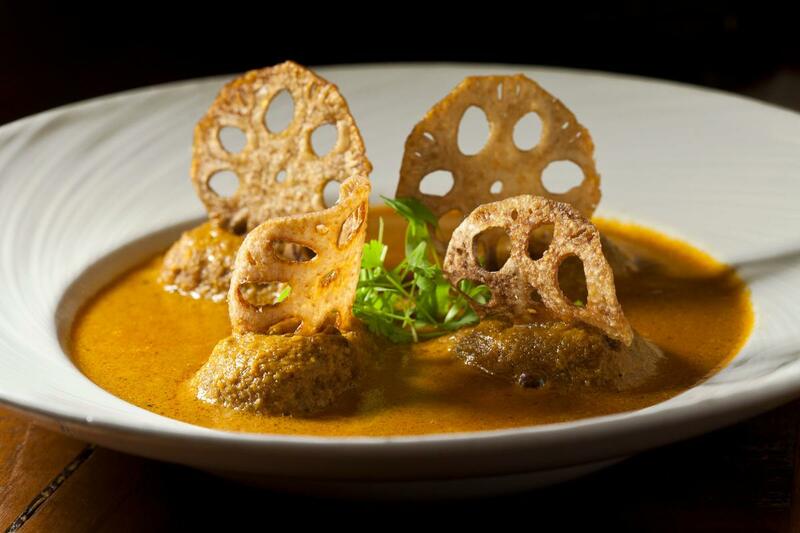 Junoon also offers a three-course tasting menu. This intimate West Village spot from celebrity chef Julieta Ballesteros is an easy walk from Washington Square Park. (La lotería, a card game that goes back to Mexico’s colonial era, lends its name to the venue, and colorful illustrations of the 54-card deck line the walls.) The restaurant’s menu features Mexican specialties like squash-blossom empanadas and beer-braised beef cheek, fried pork belly and salmon tacos, as well as heartier dishes like boneless short ribs with cilantro rice and ribeye with chorizo-spinach chilaquiles and a fried egg. La Sirène. Photo by Samira Bouaou. 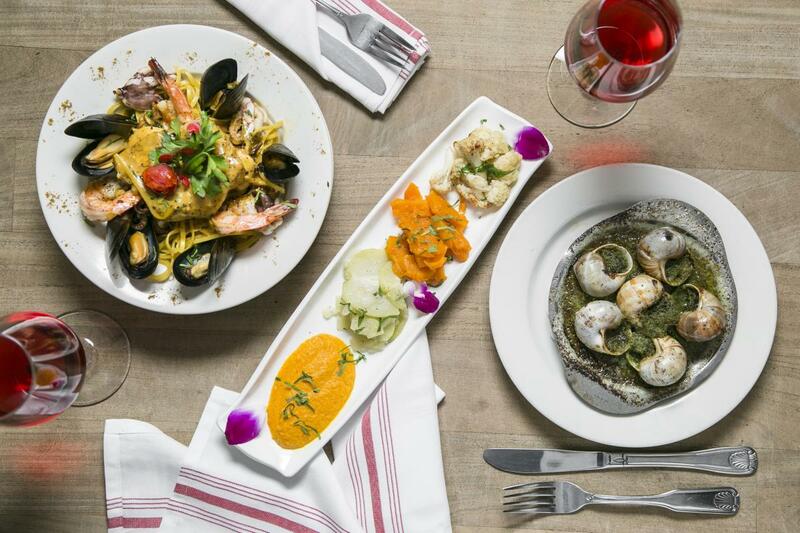 The flavors of southern France are the focus at La Sirène, which is on a quiet block in Soho. The casual restaurant is painted in bright primary colors, and travel posters highlighting the French Riviera line the walls. 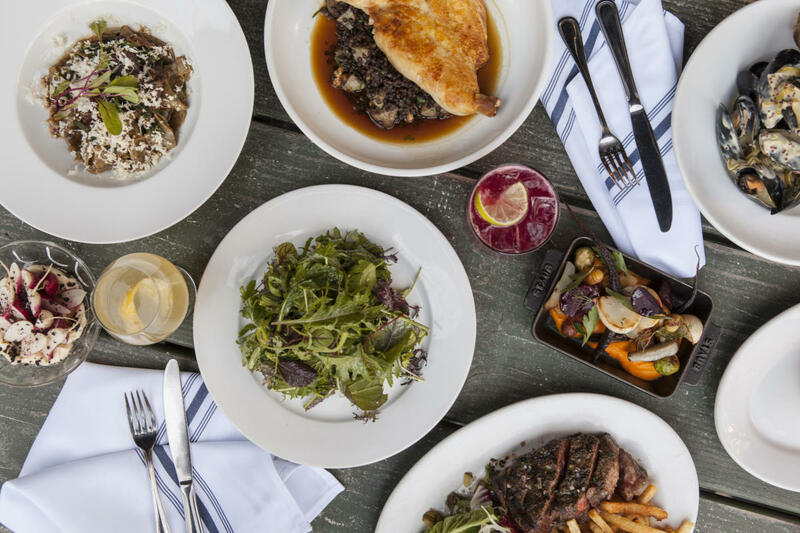 The ever-changing menu is built around the freshest ingredients, and diners can expect to find dishes like roasted quail served over caramelized apples, pork tenderloin with morel mushrooms in a port wine sauce or seared duck breast glazed in cranberry sauce. Ovelia. Photo by Marley White. This family-run restaurant offers up contemporary Greek cuisine in a refined setting in Astoria, Queens, a traditionally Greek neighborhood. Decorative mirrors line Ovelia’s muted gray walls, and the restaurant’s wraparound bar looks out onto the street. The menu includes classic dishes like moussaka and souvlaki as well as unique offerings like Greek coffee skirt steak with whipped lemon potato mash and a Wagyu hamburger dressed in a yogurt-tahini sauce. Ovelia also features a tempting array of small plates like roasted bone marrow with thyme, rosemary, black pepper and sea salt, and sesame-coated feta cheese cubes. Pera Soho. Photo courtesy of Pera Soho. This eastern Mediterranean spot in trendy Soho takes its name from Istanbul’s vibrant Pera neighborhood, and a mural of one of the city’s classic tram cars is painted on one wall. 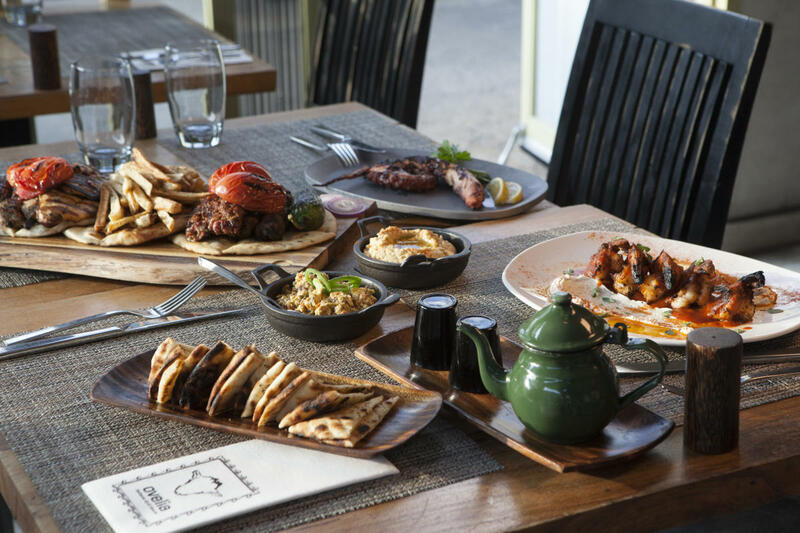 The restaurant’s inspired meze platters include fig and goat cheese flatbread, salmon tartare and beef-and-lamb sliders. Those in search of heartier fare should try the sirloin shashlik, which is marinated for 48 hours and served with truffle-salted fries. Diners can choose between the restaurant’s elegant dining room, which includes a semi-private chef’s table, and the low-slung marble-topped bar. Pera SoHo also has seasonal garden and rooftop dining. Raymi Restaurant. Photo courtesy of Raymi Restaurant. Airy, stylish Raymi is just a few minutes’ walk from Madison Square Park. The central bar is decorated with ceramic tiles and potted plants are mounted high on the walls above the dining room’s sturdy wooden tables. The menu marries the traditional flavors of Peru with a blend of Chinese, Japanese, Spanish and native influences. 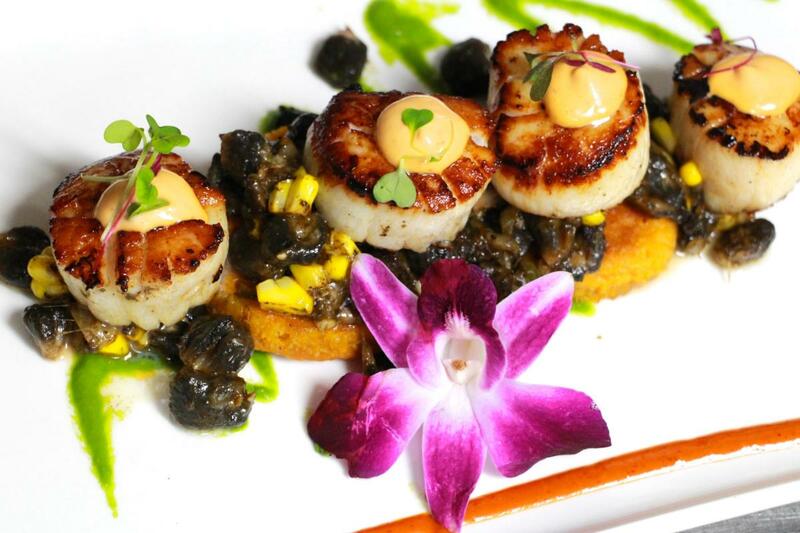 Small plates include mozzarella-and-garlic empanadas and charred octopus, while the restaurant’s dinner menu features dishes like lomo saltado and scallops with English peas and Thai chili. Cocktail lovers will want to sample some of Raymi’s 30 house-infused varieties of pisco. This lively Puerto Rican restaurant in Harlem offers visitors spectacular views of the Hudson River and the George Washington Bridge from its outdoor deck. The main dining room, which hosts DJs and live music, is lit with red-hued Edison bulbs and shimmering neon rope chandeliers. The cuisine embraces a broad range of flavors with entrées like mofongo al pilón, beef picadillo wrapped in crispy taro root and salmon with a sriracha honey glaze. South Fin Grill. Photo courtesy of South Fin Grill. Located on Staten Island’s two-and-a-half-mile-long South Beach boardwalk, spacious South Fin Grill has beautiful views of Lower New York Bay. Visitors can dine in the restaurant’s high-ceilinged dining room, or at one of the umbrella-shaded tables on the patio. The menu puts the focus on seafood with dishes like pan-seared yellowfin tuna served with a crispy Italian sausage–broccoli rabe–risotto cake and day-boat scallops with a Brussels sprout–hazelnut slaw, in addition to a range of raw seafood and sushi offerings. South Fin Grill hosts live music performances several nights a week. These are only a few of New York City’s many fantastic restaurants. 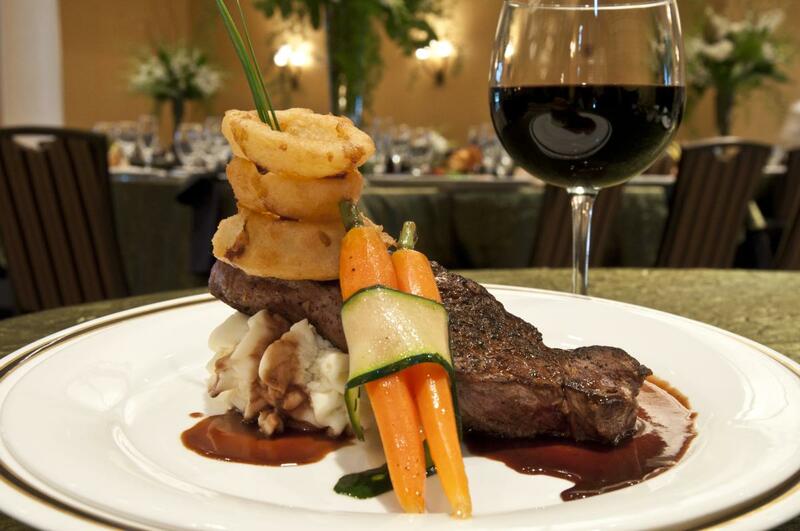 For more information on dining, see our comprehensive guide.